For the production of synthetic peptides, every year tens of thousands of tons of organic solvents are required in the chemical, cosmetic and pharmaceutical industries. According to the European Chemicals Directive REACH, these solvents are classified as substances of very high concern and their use is associated with significant risks for health and the environment. At the same time, the enormous consumption of solvents and reagents leads to high production costs. 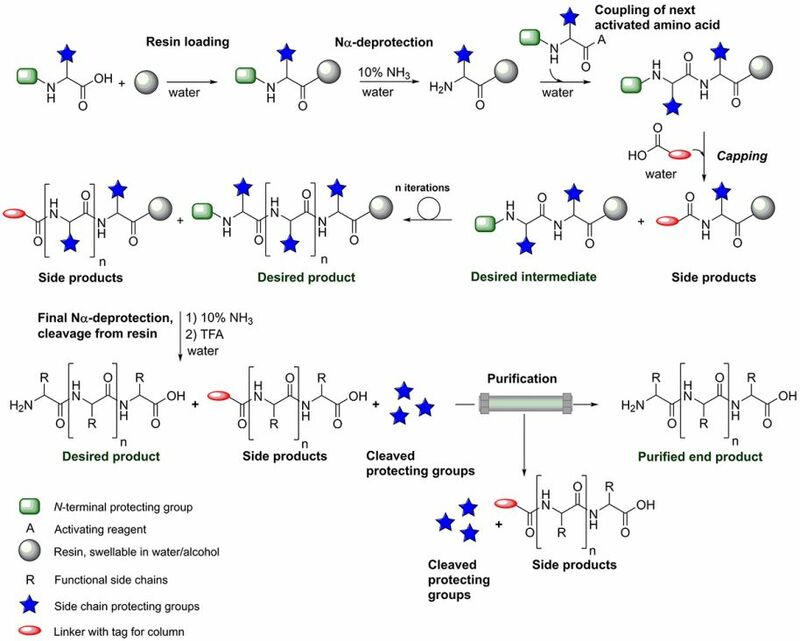 Thanks to the Clean Peptide Technology (CPT), manufacturing of peptides can be eco-friendly and take place at significantly lower costs: the application of water-soluble protecting groups makes industrial peptide production possible without having to use organic solvents. Moreover, the manufacturing process has been optimized in respect to waste water treatment, product purification and real-time monitoring of the reaction progress, leading to total production cost savings of up to 50%. Companies that use the CPT can clearly position themselves with this sustainable production form – and communicate the environmental benefits directly to their consumers. For the future, it is planned to introduce a corresponding quality label for end products.